The number of naturalised species in Queensland is increasing each year and many of these become serious weeds over time. The most effective ways of dealing with weeds is prevention and early intervention. The Queensland Herbarium provides a free plant identification service to the public. Fees may apply to commercial clients. Weed spotters keep watch for new weeds in their local area and collect specimens of potential new weeds for the Queensland Herbarium to identify. There are a number of resources to help you identify weeds including the Weeds of Australia identification tool and Weeds of National Significance. Striga asiatica, red witchweed, is a declared Class 1 pest plant. Have you seen red witchweed? 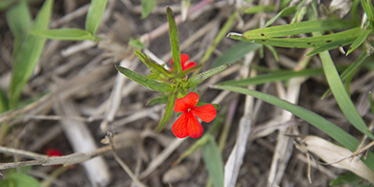 Red witchweed (Striga asiatica), was first discovered on the central Queensland coast in July 2013. The early detection of this Class 1 weed has helped to protect Queensland's agricultural industries and natural environment. Specimens were accurately identified by the Queensland Herbarium and Biosecurity Queensland officers took immediate action. Read the red witchweed photo guide for more information on how to spot this weed.